Also, available in Black and Aqua. Find out why these are flying of Amazon shelves right now! Itâ€™s small enough to fit in a pocket, but why would you ever want to put it there? Whether out on the town or just hanging with friends, the Kodak Zi8 Pocket Video Camera captures every experience in stunning 1080p HD video. Stay in focus while youâ€™re on the move with integrated image stabilization. 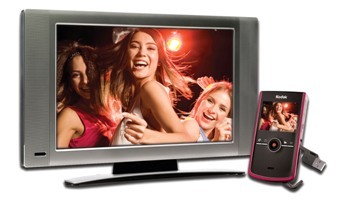 Then kick back and watch all the action on your HDTV or share your scene on YouTube with the built-in USB. The Zi8 pocket video camera has all you need to define yourself in high definition. At OfferOfTheDay.com, we highly recommend you take a look at the beautiful Kodak Zi8 Pocket Video Camera!